Sushi Cat 2 is a story of romance, intrigue, gravity, and, well, sushi. 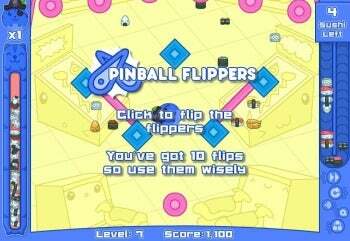 All you need to play this simple and free game is a single mouse button and a love for everything feline and kawaii. Click to drop Sushi Cat from the top of the screen, where he is held aloft between two chopsticks. Now watch him tumble across ramps and platforms, gobbling up futomaki and nigiri like crazy. Sushi Cat 2 combines physics and sushi for a bit of work-safe fun. Make no mistake: Sushi Cat 2 isn't just about getting fat on as much sushi as possible. It's about love--the love of Sushi Cat for his wife, who is also featured in the original Sushi Cat games, and whom Bacon Dog steals away at the beginning of the game. Sushi Cat must gain enough weight to capture her back. For instance, early in the game, Sushi Cat tracks down Bacon Dog and his wife at the movie theater, but is barred from entering because he is not big enough. The solution, of course, is to eat more sushi. When you drop Sushi Cat from the top of the screen, he looks like a small round ball. As soon as he begins gobbling up sushi, he begins swelling up rapidly and noticeably, becoming ever more plump and squishy. To pass a level, you must eat enough sushi to achieve a full belly. You get several chances to do this, and you can see how much sushi you've had so far in a vertical progress bar on the left side of the screen. The progress bar is made up entirely of pieces of sushi, drawn inside the (very long) belly of a cat. At the beginning of every level, this progress-bar cat appears rather forlorn, but as his belly fills up with sushi, he begins grinning happily. If you just want to quickly check how many pieces of sushi you still need to eat to complete the level, you can see that as a number on the top-right corner. Some pieces of sushi have magical powers: There's a piece that makes pinball flippers suddenly appear at the bottom of the screen, allowing you to bounce Sushi Cat back up and eat more sushi. 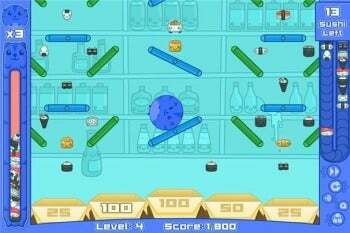 Another piece gives you three soy-sauce bombs which you must place strategically: As each bomb explodes, the sushi surrounding it is magically transported to Sushi Cat, counting towards your quota for the level. The bottom of each level is made up of a series of bins with varying point values. You should try dropping Sushi Cat so that he ends up tumbling into the bin granting the most points, although this is usually very difficult to plan. Many levels contain moving elements, making it almost impossible to plan a trajectory for Sushi Cat once you let him go. Sushi Cat 2 may not be the next Skyrim, but it is a fun way to kill some time...maybe while waiting for a sushi delivery. Note: The Download button takes you to the vendor's site, where you can play this game in your Flash-enabled browser. Drop Sushi Cat from the top of the screen and help him eat as much sushi as possible, for love!